Are You Poor in Spirit? Rejoice! What does ‘poor in spirit’ mean? 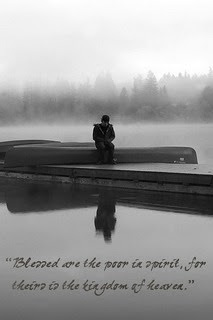 The word ‘poor’ in Greek means to crouch, a beggar (as cringing), pauper, asking alms, needy, and lacking in anything. The one ‘poor in spirit’ is lowly in heart, convinced of his or her spiritual poverty and pleads as a beggar to God to be replenished. One who is ‘poor in spirit’ has emptied himself or herself of all pride, selfishness, and ambition through humility, gratitude, and submission to God. ‘Blessed’ in Greek means happy, supremely blest, fortunate, well off, and of that which is the highest good. The Greek word for ‘kingdom’ means royal power, kingship, dominion, rule, the territory subject to the rule of a king. Without recognizing one’s lack of spirit, one cannot realize God’s fullness. Grace cannot be poured out to one oblivious of his or her necessity for it. 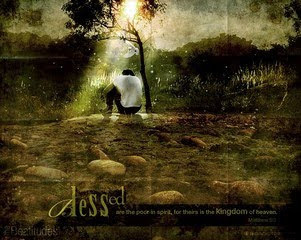 The poor in spirit have the fulfillment of heaven’s kingdom dominion. Are you poor in spirit? Then, shout because you are blessed. The riches of Christ are yours. The kingdom of heaven is yours. Hallelujah! ‘Poor in spirit’ does not mean poor in spirituality. The one poor in spirit is lowly in heart, convinced of his or her spiritual poverty and pleads as a beggar to God to be replenished.